Toronto, Ontario, November 10, 2016 – youRhere Inc. is pleased to announce that it has completed the installation of four interactive directories at Scotia Plaza, located at 40 King Street West in the heart of Toronto’s financial district. The directories, two on the main level and two on the concourse level, utilize 42” interactive PCAP screens, flush-mounted with stainless steel framing, custom-designed to complement the building’s recently completed renovations. 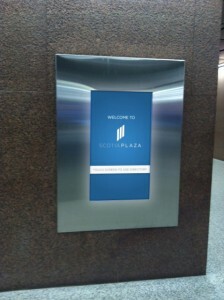 Each directory provides visitors to Scotia Plaza with a wealth of information about the three-building complex, its tenants and amenities. The directories are multi-lingual (English, French, Spanish and Chinese). They provide mobility impaired visitors with access to the directories via drop down screen menus, coupled with an accessible interface and wayfinding which routes them via elevators vs. escalators. The directories also provide live transit information on the subway, bus, streetcar and computer trains which serve the building, along with full-search capabilities for area attractions and Toronto’s PATH system, which, at over 30 km (19 miles), is recognized as the world’s largest underground shopping complex. Designed by acclaimed WZMH Architects and managed by Dream Unlimited Corporation, Scotia Plaza brilliantly blends Toronto’s business history with the best of modernistic design. Its striking exterior is matched only by its inspiring and innovative use of interior spaces. A bold 130-foot-tall atrium seamlessly merges the historic Beaux Arts Bank of Nova Scotia building (built in 1946) to the modern 68-story tower and grand lobby (constructed in 1985) and running the full length of the complex. The development is bordered by Yonge Street on the east, King Street West on the south, Bay Street on the west, and Adelaide Street West on the north. At 275 m (902 ft), Scotia Plaza is Canada’s third-tallest building and the 22nd-tallest building in North America. It is connected to the PATH network, and contains 190,000 m2 (2,045,143 sq ft) of office space on 68 floors and 40 retail stores. With more than 650 screens installed coast to coast, youRhere is Canada’s leading provider of interactive digital signage, including informational directories and wayfinding applications. Working with our building owner/manager clients, in conjunction with our signage fabrication partners, youRhere offers a wide variety of enclosures which house touchscreen monitors, computers and other peripherals which run our proprietary software. Once installed, youRhere offers a variety of hardware and software support packages, including remote monitoring to ensure the highest level of uptime for our clients, large and small.